"Ohms too high" means you're exceeding the maximum voltage output the board can provide. this means, the wattage will automatically be adjusted down to level it can output. 6 volts MAX for the DNA 133 / DNA 167. 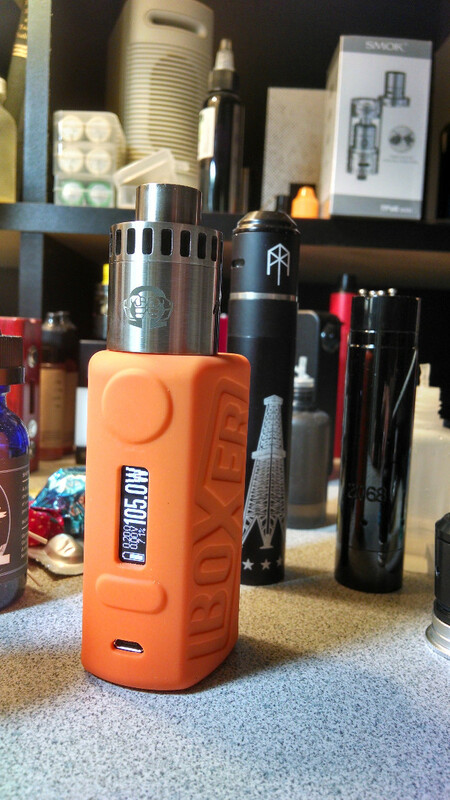 9 volts MAX for the DNA 200.
my suggestion to you is, build a lower ohm coil. this will help you avoid the "ohms too high" message. Well that is with .2ohm coils. I do still get the step down in wattage and voltage without any error message while firing when the new batteries are draining. You guys know more about this stuff than I would so I don't try to come across as though I understand it all. I just feel like it doesn't give me what I thought it would. there should be some message that flashes across the screen, unless you have your error flashes set 0 or 1 times. my guess is your hitting your "cell soft cutoff" limit. if you know you are using the correct cells (cells that have an amp rating capable of providing the power you're asking from them) and still getting a reduction in power, i would email Boxer and describe your problem. you have some bad wire soldering. Boxer would be the people who would fix that for you. it should still be under warranty, right? im curious, what kind of cells are you using? My money would be on the battery contacts...just saying. I got this a few days ago in a trade. Supposed to be almost brand new. New batts fresh out of box are Samsung 25r's. Never used them before but are comparable to LG HE4's. Boxer would not have warranty left I doubt but I can check. maybe that's why the person wanted to trade it. this could have been a preexisting problem. the old "not my problem anymore" type of thing. like dwcraig1 mentioned, are the cell contacts dirty or weak (not pushing hard enough against the ends of the cells themselves will introduce resistance into the battery circuit)? misaligned cell contacts will also reduce cell connectivity. make sure they're clean, firm against the cells and flat against the cell ends (the contacts aren't sitting crooked against the cell). Oh yah, I'll take another look here shortly. Good idea. Didn't seem like anything unusual when I looked before but I'll check it out more closely. Well as of this typing I'm at 88% charge left and it's performing better than it has since I brought it home a few nights ago. I noticed the contacts were not out enough as to apply good pressure to the cells so I corrected that on all four and checked all the soldering points and wires and wire bends where they are tight and so on. So far it stays where I set it watts wise while firing at the 88% charge point. We'll see what happens but I can already tell it's doing better than it did. Thanks guys. Maybe this is all it needed. I'll find out as the batts drain further. @asmodeous evolv is open to suggestions. post your idea in the feature request thread. i think a voltage based battery meter with sag would be a nice option for the DNA 75 and 60, especially. Where is that? I switched my "set profile" to pack voltage and I really want this instead of a battery meter. If they could tuck the pack voltage horizontally into the spot of the battery meter I'd be tickled. I can see it out of the corner of my eye when I'm vaping and I would be able to see my sag voltage and easily tell when I'm about to hit the soft cut/low voltage limit and need to change batteries.